An acetate is a salt formed by the combination of acetic acid with an alkaline, earthy, metallic or nonmetallic and other base. "Acetate" also describes the conjugate base or ion (specifically, the negatively charged ion called an anion) typically found in aqueous solution and written with the chemical formula C2H3O−2. The neutral molecules formed by the combination of the acetate ion and a positive ion (called a cation) are also commonly called "acetates" (hence, acetate of lead, acetate of aluminum, etc.). The simplest of these is hydrogen acetate (called acetic acid) with corresponding salts, esters, and the polyatomic anion CH3CO−2, or CH3COO−. Most of the approximately 5 billion kilograms of acetic acid produced annually in industry are used in the production of acetates, which usually take the form of polymers. In nature, acetate is the most common building block for biosynthesis. For example, the fatty acids are produced by connecting the two carbon atoms from acetate to a growing fatty acid. In inorganic chemistry, bicarbonate (IUPAC-recommended nomenclature: hydrogencarbonate) is an intermediate form in the deprotonation of carbonic acid. It is a polyatomic anion with the chemical formula HCO−3. Bicarbonate serves a crucial biochemical role in the physiological pH buffering system.The term "bicarbonate" was coined in 1814 by the English chemist William Hyde Wollaston. The prefix "bi" in "bicarbonate" comes from an outdated naming system and is based on the observation that there is twice as much carbonate (CO2−3) per sodium ion in sodium bicarbonate (NaHCO3) and other bicarbonates than in sodium carbonate (Na2CO3) and other carbonates. The name lives on as a trivial name. The chloride ion is the anion (negatively charged ion) Cl−. It is formed when the element chlorine (a halogen) gains an electron or when a compound such as hydrogen chloride is dissolved in water or other polar solvents. 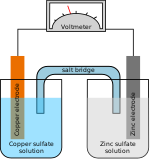 Chloride salts such as sodium chloride are often very soluble in water. It is an essential electrolyte located in all body fluids responsible for maintaining acid/base balance, transmitting nerve impulses and regulating fluid in and out of cells. Less frequently, the word chloride may also form part of the "common" name of chemical compounds in which one or more chlorine atoms are covalently bonded. For example, methyl chloride, with the standard name chloromethane (see IUPAC books) is an organic compound with a covalent C−Cl bond in which the chlorine is not an anion. In chemistry, a coordination complex consists of a central atom or ion, which is usually metallic and is called the coordination centre, and a surrounding array of bound molecules or ions, that are in turn known as ligands or complexing agents. Many metal-containing compounds, especially those of transition metals, are coordination complexes. A coordination complex whose centre is a metal atom is called a metal complex. The helium hydride ion or hydridohelium(1+) ion is a cation (positively charged ion) with chemical formula HeH+. It consists of a helium atom bonded to a hydrogen atom, with one electron removed. It is the lightest heteronuclear ion, and is believed to be one of the first compounds formed in the Universe after the Big Bang.The ion was first produced in a laboratory in 1925. It is stable in isolation, but extremely reactive, and cannot be prepared in bulk, because it would react with any other molecule with which it came in contact. Noted as the strongest known acid, its occurrence in the interstellar medium has been conjectured since the 1970s, and it was finally detected in April 2019. A hydrogen ion is created when a hydrogen atom loses or gains an electron. A positively charged hydrogen ion (or proton) can readily combine with other particles and therefore is only seen isolated when it is in a gaseous state or a nearly particle-free space. Due to its extremely high charge density of approximately 2×1010 times that of a sodium ion, the bare hydrogen ion cannot exist freely in solution as it readily hydrates, i.e., bonds quickly. The hydrogen ion is recommended by IUPAC as a general term for all ions of hydrogen and its isotopes. Depending on the charge of the ion, two different classes can be distinguished: positively charged ions and negatively charged ions. Ion channels are pore-forming membrane proteins that allow ions to pass through the channel pore. Their functions include establishing a resting membrane potential, shaping action potentials and other electrical signals by gating the flow of ions across the cell membrane, controlling the flow of ions across secretory and epithelial cells, and regulating cell volume. Ion channels are present in the membranes of all excitable cells. Ion channels are one of the two classes of ionophoric proteins, the other being ion transporters.The study of ion channels often involves biophysics, electrophysiology, and pharmacology, while using techniques including voltage clamp, patch clamp, immunohistochemistry, X-ray crystallography, fluoroscopy, and RT-PCR. Their classification as molecules is referred to as channelomics. An ion thruster or ion drive is a form of electric propulsion used for spacecraft propulsion. It creates thrust by accelerating cations by utilizing electricity. The term refers strictly to gridded electrostatic ion thrusters, and is often incorrectly loosely applied to all electric propulsion systems including electromagnetic plasma thrusters.An ion thruster ionizes a neutral gas by extracting some electrons out of atoms, creating a cloud of positive ions. These thrusters rely mainly on electrostatics as ions are accelerated by the Coulomb force along an electric field. Temporarily stored electrons are finally reinjected by a neutralizer in the cloud of ions after it has passed through the electrostatic grid, so the gas becomes neutral again and can freely disperse in space without any further electrical interaction with the thruster. Electromagnetic thrusters on the contrary use the Lorentz force to accelerate all species (free electrons as well as positive and negative ions) in the same direction whatever their electric charge, and are specifically referred as plasma propulsion engines, where the electric field is not in the direction of the acceleration.Ion thrusters in operational use have an input power need of 1–7 kW, exhaust velocity 20–50 km/s, thrust 25–250 millinewtons and efficiency 65–80% though experimental versions have achieved 100 kW, 5N.The Deep Space 1 spacecraft, powered by an ion thruster, changed velocity by 4.3 km/s while consuming less than 74 kilograms of xenon. The Dawn spacecraft broke the record, with a velocity change of 10 km/s.Applications include control of the orientation and position of orbiting satellites (some satellites have dozens of low-power ion thrusters) and use as a main propulsion engine for low-mass robotic space vehicles (such as Deep Space 1 and Dawn).Ion thrust engines are practical only in the vacuum of space and cannot take vehicles through the atmosphere because ion engines do not work in the presence of ions outside the engine. Additionally, the engine's minuscule thrust cannot overcome any significant air resistance. Spacecraft rely on conventional chemical rockets to initially reach orbit. Ligand-gated ion channels (LICs, LGIC), also commonly referred to as ionotropic receptors, are a group of transmembrane ion-channel proteins which open to allow ions such as Na+, K+, Ca2+, and/or Cl− to pass through the membrane in response to the binding of a chemical messenger (i.e. a ligand), such as a neurotransmitter.When a presynaptic neuron is excited, it releases a neurotransmitter from vesicles into the synaptic cleft. The neurotransmitter then binds to receptors located on the postsynaptic neuron. If these receptors are ligand-gated ion channels, a resulting conformational change opens the ion channels, which leads to a flow of ions across the cell membrane. This, in turn, results in either a depolarization, for an excitatory receptor response, or a hyperpolarization, for an inhibitory response. A lithium-ion battery or Li-ion battery (abbreviated as LIB) is a type of rechargeable battery, first proposed by chemist M Stanley Whittingham at Exxon in the 1970s. Today lithium-ion batteries are commonly used for portable electronics and electric vehicles and are growing in popularity for military and aerospace applications.In the batteries lithium ions move from the negative electrode to the positive electrode during discharge and back when charging. Li-ion batteries use an intercalated lithium compound as one electrode material, compared to the metallic lithium used in a non-rechargeable lithium battery. The batteries have a high energy density, no memory effect (other than LFP cells) and low self-discharge. They can however be a safety hazard since they contain a flammable electrolyte, and if damaged or incorrectly charged can lead to explosions and fires. Samsung were forced to recall Galaxy Note handsets following lithium-ion fires, and have been several incidents involving batteries on Boeing 787s. Chemistry, performance, cost and safety characteristics vary across LIB types. Handheld electronics mostly use LIBs based on lithium cobalt oxide (LiCoO2), which offers high energy density but presents safety risks, especially when damaged. Lithium iron phosphate (LiFePO4), lithium ion manganese oxide battery (LiMn2O4, Li2MnO3, or LMO), and lithium nickel manganese cobalt oxide (LiNiMnCoO2 or NMC) offer lower energy density but longer lives and less likelihood of fire or explosion. Such batteries are widely used for electric tools, medical equipment, and other roles. NMC in particular is a leading contender for automotive applications. In chemistry, pH () is a scale used to specify how acidic or basic a water-based solution is. Acidic solutions have a lower pH, while basic solutions have a higher pH. At room temperature (25 °C), pure water is neither acidic nor basic and has a pH of 7. The pH scale is logarithmic and approximates the negative of the base 10 logarithm of the molar concentration (measured in units of moles per liter) of hydrogen ions in a solution. More precisely it is the negative of the base 10 logarithm of the activity of the hydrogen ion. At 25 °C, solutions with a pH less than 7 are acidic and solutions with a pH greater than 7 are basic. The neutral value of the pH depends on the temperature, being lower than 7 if the temperature increases. Contrary to popular belief, the pH value can be less than 0 or greater than 14 for very strong acids and bases respectively.The pH scale is traceable to a set of standard solutions whose pH is established by international agreement. Primary pH standard values are determined using a concentration cell with transference, by measuring the potential difference between a hydrogen electrode and a standard electrode such as the silver chloride electrode. The pH of aqueous solutions can be measured with a glass electrode and a pH meter, or a color-changing indicator. Measurements of pH are important in chemistry, agronomy, medicine, water treatment, and many other applications. A phosphate is a chemical derivative of phosphoric acid. The phosphate ion (PO3−4) is an inorganic chemical, the conjugate base that can form many different salts. In organic chemistry, a phosphate, or organophosphate, is an ester of phosphoric acid. Of the various phosphoric acids and phosphates, organic phosphates are important in biochemistry and biogeochemistry (and, consequently, in ecology), and inorganic phosphates are mined to obtain phosphorus for use in agriculture and industry. At elevated temperatures in the solid state, phosphates can condense to form pyrophosphates. The sulfate or sulphate (see spelling differences) ion is a polyatomic anion with the empirical formula SO2−4. Sulfate is the spelling recommended by IUPAC, but sulphate is used in British English. Salts, acid derivatives, and peroxides of sulfate are widely used in industry. Sulfates occur widely in everyday life. Sulfates are salts of sulfuric acid and many are prepared from that acid.